The 40 Days of Action in May and June were an exciting launch for the Poor People's Campaign in New York and nationwide, and we're excited to invite you to take part in the next steps of the campaign here in New York. 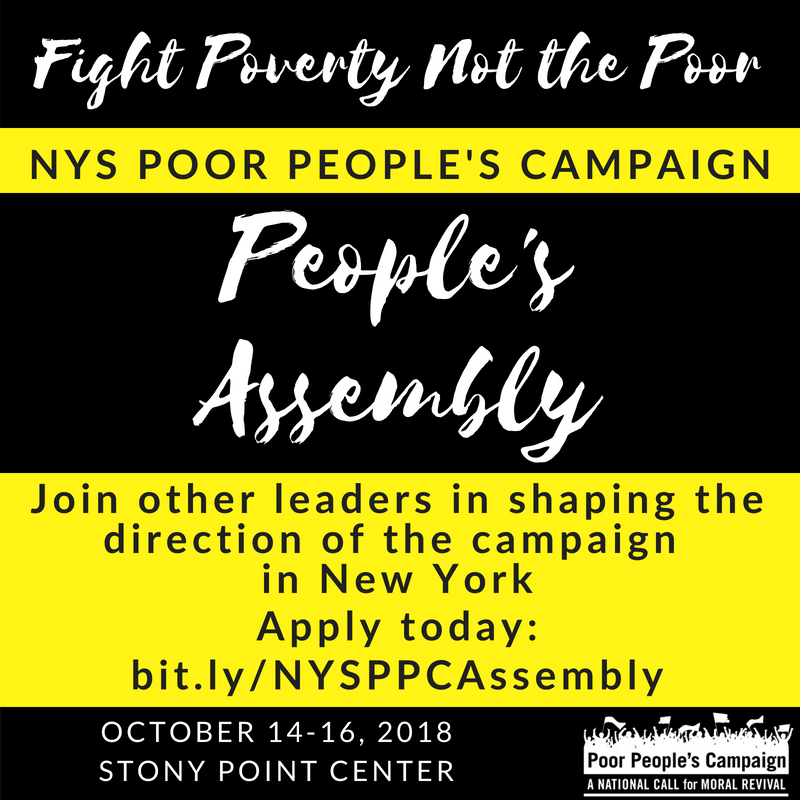 The Assembly will be held October 14-16 at the Stony Point Center, and will connect our statewide movement more deeply around the principles and vision of the Poor People's Campaign, while discussing and planning our collective next steps. Applications are due August 31st, so apply today! The Nation magazine recently published a fantastic overview of the campaign and roundup of what was accomplished during the 40 Days of Action nationwide. Read it here. More than just a series of rallies and actions, a new model of organizing in this country has been catalyzed. From Alaska to Alabama; from California to the Carolinas; from Flint, Michigan, to Oak Flat, Arizona, people are coming together to organize moral outrage around poverty, racism, ecological devastation, and militarism into a transforming force, to turn the poor into agents of change rather than objects of history. Prior participation in the Campaign is not necessary to apply for the Assembly. Whether you participated in civil disobedience or have simply watched from afar, if you want to help build this movement, please apply today. The People's Assembly will begin at 4pm on Sunday, October 14 and conclude at 1pm on Tuesday, October 16. Double occupancy accommodation and all meals will be provided at a cost of $200 per person. We will have some funds available for scholarships and transportation costs and will do all we can to make the gathering accessible. All activities will take place in accessible areas and we will make every effort to accommodate any particular needs. (Click here for more information on the venue.) We will be in touch to ask about your needs in those areas once registration confirmations are sent out, by September 7. This is an important opportunity to continue building the campaign in New York! You can help spread the word by inviting others to apply and sharing the above image on social media.